Scarlett hasn't been feeling too well since her port placement on Friday. I haven't had my hands free to type much all weekend. Now, I finally found a way to hold her in the Moby Wrap that she will tolerate, so I can type for a minute. The procedure Friday was quick and easy, as far as surgeries go. It took a long time for them to get started, but then it was all over in a few hours, and we were home in time for dinner. The port doesn't seem to bother Scarlett, though I think her chest is a little sore. She is so small that it sticks out pretty far, but as she grows it will be less and less obtrusive. She has a cough that sometimes causes her to choke. It could be a result of the anesthesia from Friday, or it could be a cold. It has me on edge all day and night as I try to keep her comfortable. I am waiting to hear back from the doctors about what to do...if she is sick, I don't think we will be able to start chemo this week, and that is a problem. Her fontanel is also a bit swollen, which means there is fluid accumulation in her brain. They will check this all tomorrow, but it could mean a shunt is in the near future...or not. I don't know. Good news, though - we were finally able to bring our dog home. He has been staying with my parents since Scarlett was first hospitalized. He is very happy to be home, and we are happy to have him (though I am not enjoying the game of taking him outside to do his business with no results...) Cosmo is a Cocker Spaniel - Poodle mix (otherwise known as a Cockapoo) that we rescued from a shelter about a year and half ago. He is about 2 years old now and weighs about 15 pounds. He knows a few tricks and is usually well-behaved, though very excitable. He's also very snuggly. While we would never have planned to have a young dog and a baby at the same time in our tiny house, he's fun to have around. I'm tentatively packing in case we end up in the hospital sooner than we planned. If not, we go tomorrow for a hearing test and blood draw, then she will be admitted Thursday for her first round of chemotherapy. If you haven't gotten one already, maybe a humidifier will help with her cough. I swear by mine for both colds and allergies. I hope the cough goes away soon and that everything checks out fine tomorrow. Still thinking about Scarlett every day. I hope the first round of chemo goes smoothly. I hope she feels better soon poor little one. more prayers for her. My continued prayers for your October baby. My family had a cockapoo growing up-such wonderful memories and a great breed!! Sending prayers for you all! What a cute dog! Hopefully it's just related to Friday's procedure. You girls are strong- you'll be ok :) Thinking of you often! I hope she is feeling better very soon! Prayers and strength sent your little ladybugs way! We're still praying for your little miracle baby! Hugs and prayers for you guys! Still thinking of you every day and telling everyone I know to say a prayer for a smooth recovery and start of chemo. I agree with the humidifier( cool mist) and a pillow under one side of her crib to keep her head/chest elevated. Hope she wakes up feeling better tomorrow!! My best friend has a black cockapoo and she looks like a little teddy bear. They are so cute. Good luck at the doctors tomorrow! praying for her today and every day... love you guys! I hope Scarlett feels better soon! 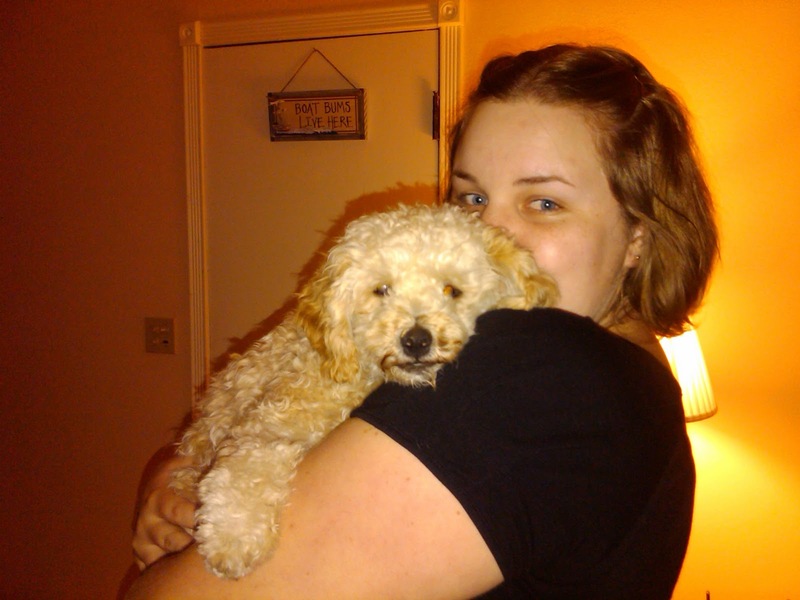 And I have a Cockapoo too :) They're great dogs! She loves playing with my son. I'm sure Scarlett and Cosmo will be great friends one day too. The port will be wonderful once chemo starts but having it put in is quite uncomfortable. When my sister had hers put in we thought: little operation = little pain but she actually found recovery from that worse than major abdominal surgery. It takes some time for the port to adhere to muscle/flesh or whatever it adheres to internally and she said she could feel it moving around a bit. So I guess that Scarlett is going through much the same. I have been following your Blog since Scarlett's diagnosis. Wishing you all well and hoping that chemo goes ahead this week. It is scary but worse not doing anything. I hope that everything will be alright! Hope she starts feeling better! My LO has a cough too right now.. :-( I have a humidifier.. I do try to put baby vicks under her feet..and some on her chest at bed time.. I hope Scarlett feels better soon! I second keeping the head of the crib (or bassinet or wherever she sleeps:) elevated, it makes it so much easier for them to breathe, thats what I have been doing with my Oct. baby! We will be thinking of you all. Keep fighting Scarlett, thoughts and prayers are being sent your way from Virginia! Sweet baby, I hope she feels better ASAP! I pray for her constantly and tell people about her regularly! :) Good luck with all that is to come! Our prayers are definitely with you right now. I hope that it isn't a cold and that she still doesn't need that shunt. God is still the worker of miracles today that he was in the past. Lots of prayers and thoughts your way, from San Diego, CA!!! Beautiful angel, she's fighting the big fight and doing incredibly!